The very earliest digital synthesis experiments were made with computers, as part of academic research into sound generation. In 1973, the Japanese company Yamaha licensed the algorithms for frequency modulation synthesis (FM synthesis) from John Chowning, who had experimented with it at Stanford University since 1971. 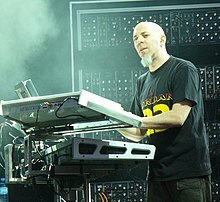 Yamaha's engineers began adapting Chowning's algorithm for use in a commercial digital synthesizer, adding improvements such as the "key scaling" method to avoid the introduction of distortion that normally occurred in analog systems during frequency modulation, though it would take several years before Yamaha were to release their FM digital synthesizers. In the 1970s, Yamaha were granted a number of patents, under the company's former name "Nippon Gakki Seizo Kabushiki Kaisha", evolving Chowning's early work on FM synthesis technology. Yamaha built the first prototype digital synthesizer in 1974. Released in 1979, the Casio VL-1 was the first commercial digital synthesizer, selling for $69.95. Yamaha eventually commercialized their FM synthesis technology and released the first FM digital synthesizer in 1980, the Yamaha GS-1, but at an expensive retail price of $16,000. Early commercial digital synthesizers used simple hard-wired digital circuitry to implement techniques such as additive synthesis and FM synthesis. Other techniques, such as wavetable synthesis and physical modeling, only became possible with the advent of high-speed microprocessor and digital signal processing technology. Two other early commercial digital synthesizers were the Fairlight CMI, introduced in 1979, and the New England Digital Synclavier II, introduced in 1980. 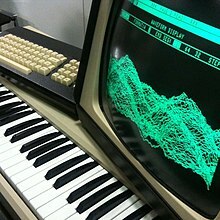 The Fairlight CMI was a sampling synthesizer, while the Synclavier originally used FM synthesis technology licensed from Yamaha, before adding sampling synthesis later in the 1980s. The Fairlight CMI and the Synclavier were both expensive systems, retailing for more than $20,000 in the early 1980s. The cost of digital synthesizers began falling rapidly in the early 1980s. E-mu Systems introduced the Emulator sampling synthesizer in 1982 at a retail price of $7,900. Although not as flexible or powerful as either the Fairlight CMI or the Synclavier, its lower cost and portability made it popular. Introduced in 1983, the Yamaha DX7 was the breakthrough digital synthesizer to have a major impact, both innovative and affordable, and thus spelling the decline of analog synthesizers. It used FM synthesis and, although it was incapable of the sampling synthesis of the Fairlight CMI, its price was around $2,000, putting it within range of a much larger number of musicians. The DX-7 was also known for its "key scaling" method to avoid distortion and for its recognizabley bright tonality that was partly due to its high sampling rate of 57 kHz. It became indispensable to many music artists of the 1980s, and would become one of the best-selling synthesizers of all time. In 1987, Roland released its own influential synthesizer of the time, the D-50. This popular synth broke new ground in affordably combining short samples and digital oscillators, as well as the innovation of built-in digital effects (reverb., chorus, equalizer). Roland called this Linear Arithmetic (LA) synthesis. This instrument is responsible for some of the very recognisable preset synthesizer sounds of the late 1980s, such as the Pizzagogo sound used on Enya's "Orinoco Flow." The main difference is that a digital synthesizer uses digital processors and analog synthesizers use analog circuitry. A digital synthesizer is in essence a computer with (often) a piano-keyboard and an LCD as an interface. An analog synthesizer is made up of sound-generating circuitry and modulators. Because computer technology is rapidly advancing, it is often possible to offer more features in a digital synthesizer than in an analog synthesizer at a given price. However, both technologies have their own merit. Some forms of synthesis, such as, for instance, sampling and additive synthesis are not feasible in analog synthesizers, while on the other hand, many musicians prefer the character of analog synthesizers over their digital equivalent. ^ a b "[Chapter 2] FM Tone Generators and the Dawn of Home Music Production". Yamaha Synth 40th Anniversary - History. Yamaha Corporation. 2014. ^ a b Holmes, Thom (2008). "Early Computer Music". Electronic and experimental music: technology, music, and culture (3rd ed.). Taylor & Francis. p. 257. ISBN 0-415-95781-8. Retrieved 2011-06-04. ^ Holmes, Thom (2008). "Early Computer Music". Electronic and experimental music: technology, music, and culture (3rd ed.). Taylor & Francis. pp. 257–258. ISBN 0-415-95781-8. Retrieved 2011-06-04. ^ a b Mark Vail. The Synthesizer: A Comprehensive Guide to Understanding, Programming, Playing, and Recording the Ultimate Electronic Music Instrument. Oxford University Press. p. 277. ^ Alex Igoudin. Impact of MIDI on electroacoustic art music, Issue 102. Stanford University. p. 26. ^ "1978 New England Digital Synclavier". Mix. Penton Media. September 1, 2006. ^ Le Heron, Richard B.; Harrington, James W. (2005). New Economic Spaces: New Economic Geographies. Ashgate Publishing. p. 41. ISBN 0-7546-4450-2. ^ Holmes, Thom (2008). "Early Computer Music". Electronic and experimental music: technology, music, and culture (3rd ed.). Taylor & Francis. pp. 257–259. ISBN 0-415-95781-8. Retrieved 2011-06-04. ^ "Three Yamaha products that reshaped the industry mark 20th anniversary". Music Trades. February 2004. pp. 70–74. Archived from the original on 2008-10-19. ^ "Synth FX". Sound On Sound. Retrieved 2014-01-09. ^ Roland D-50 Owner's Manual (Basic) (PDF). Roland Corporation. c. 1987. p. 6. Archived from the original (PDF manual) on 2013-05-31. Retrieved 2014-09-01. ... D-50 has four distinct sections: / 1. A Digital Synthesizer / 2. A Digital Equalizer / 3. A Digital Chorus section / and 4. A Digital Reverberation section. ^ "The Korg M1". Sound On Sound. Archived from the original on 2013-10-20. Retrieved 2014-01-09. ^ "Electronic Instruments". Encyclopædia Britannica. ^ "Digital Synthesis". UCSC Electronic Music Studios. This page was last edited on 27 January 2019, at 00:40 (UTC).